Head and mid-pipes constructed from stainless steel. Exhaust cans constructed from aluminum and available in either brushed or anodized black. Customizable can length for sound/power needs. MSRP: $879.95 brushed aluminum/$934.95 anodized black. During our quick evaluation of the exhaust, we did one on-and-off installation which was quite easy due to Honda’s newest twin-pipe design. Also, this Rocket system uses a total of six components (headpipe, split pipe, two mid-pipes, and two exhaust cans), which makes the install process a breeze. While it may seem like a lot of pieces, it really ensures there was enough room to easily put the whole system together. 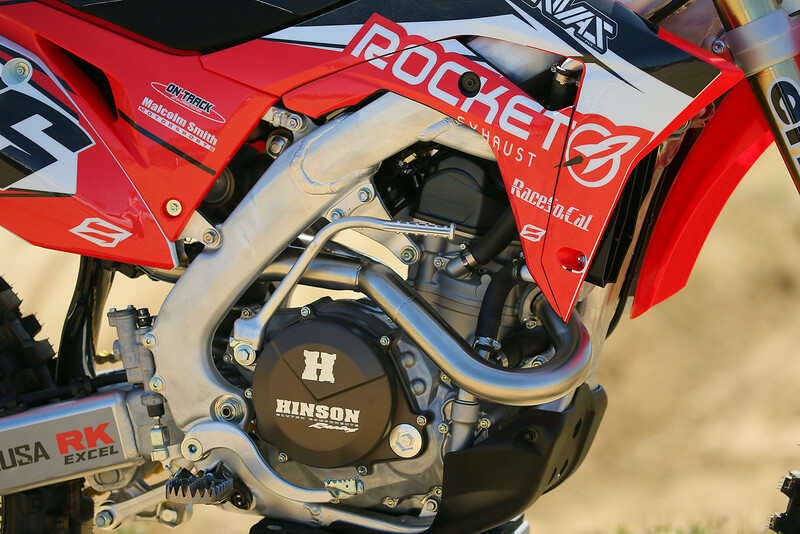 Once on the bike, we’re pleased with the look of the system….especially considering the new CRF450R makes it quite difficult to achieve the stock-style short cans due to their tapered design. The positive for Rocket in this aspect, was being able to retain a fairly short can length without designing an all-new exhaust. 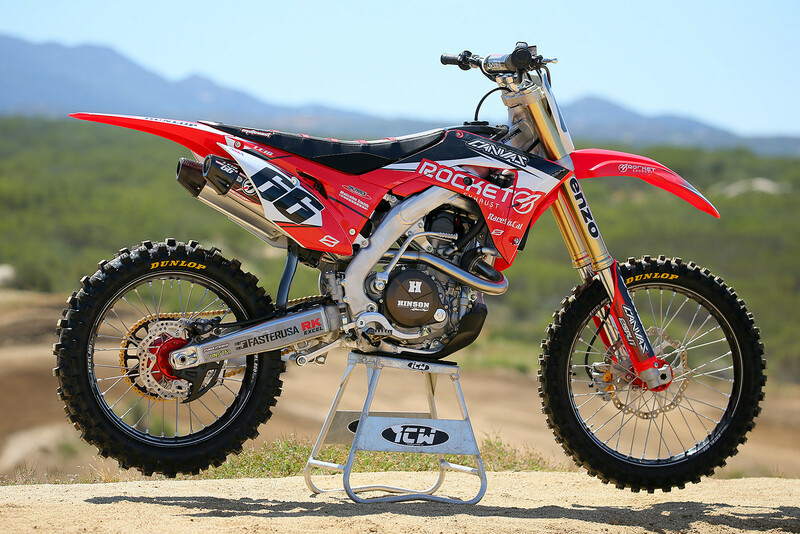 While the newest CRF was definitely a huge step in the right direction for Big Red, there were still a few things most of our riders wanted to tweak during our ’17 450 shootout. Although 450s make plenty of power, most of us wanted more of a traditional 450 snap off the bottom. In stock trim, the bike felt a bit lethargic in certain situations when rolling on the power but it comes on extremely strong as it enters the mid-range. The general opinion in our test group was if that snap came on a bit sooner, it would not only feel more powerful but also be easier to ride overall as that hit would be in a more useful point of the powerband. So naturally, we’d hope to fix or put a dent in this gap with an exhaust system. Over the back-and-forth motos we did with the Rocket Exhaust’s system, we noticed it really hit the mark in fixing our digs against the power in the shootout. It was instantly noticeable that the hit had been moved much earlier into the RPM range, giving it more of the bark/snap we’d expect from a 450, making it easier to power out of corners in third where the stock system lags a bit. It also really helps in second gear/tighter corners where the bike would lurch a bit as it rolled into the mid-range hit towards the exit of rut. This was due to the progresive feel it had in this middle RPM range instead. Overall, the system seemed pulled just as strong as stock through the mid and ran just a bit cleaner up top as well. During our day with the exhaust there was only one real negative we could find, as the system is a bit louder than stock. Which due to the can length, we can understand why it is. The overall sound/tone is better than stock in our opinion, but at idle and low RPMs…it’s definitely a bit noisier overall. Mid-RPMs and up though, it’s not as noticeable as the volume seems more in-line with the stock unit. 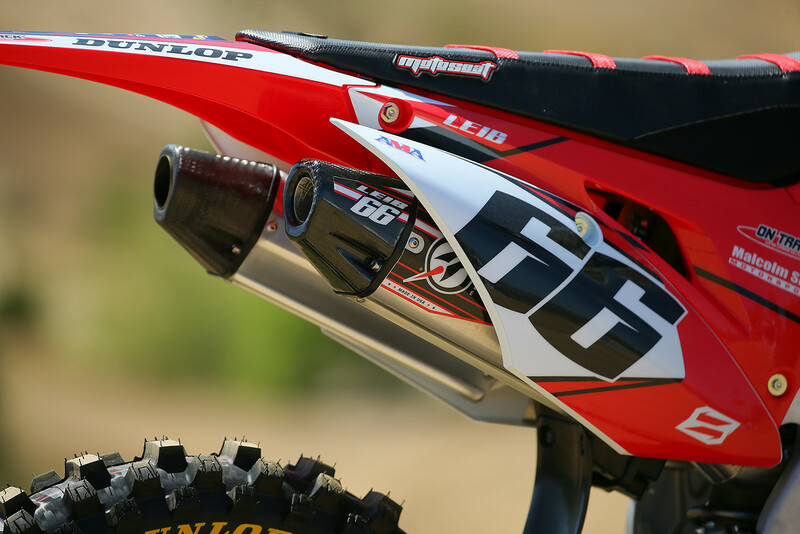 Now if you’ve got a ’17 CRF450R and feels it needs that true 450 grunt off the bottom while retaining the great mid-to-top it already has, we would definitely recommend a Rocket Exhaust system…especially considering it’s between $50-100 less than most competitors stainless models. If you’re worried about noise call them up, as all their systems are built to order and they could work with you on any questions.